You may not realise it, but chances are some of your fleet will be coated in Glasurit paint. Chris Peat takes a look at the paint manufacturer. Glasurit – originally made in Germany. Fresh paintwork is something that benefits vehicles new and old, whether to breathe new life into an older vehicle or as part of an upgrade of a newer vehicle to a higher specification for a more premium service. You may have read about refurbishers and paintshops that can carry this work out, but what about the actual paint they use? If you have taken one of your vehicles for a fresh coat of paint, then there is a good chance it was covered in one of Glasurit’s products. According to Mark Appleton, the company’s CV Field Sales Manager – Automotive Refinish UK & Ireland, it supplies around 75% of the UK’s refurbishment shops. 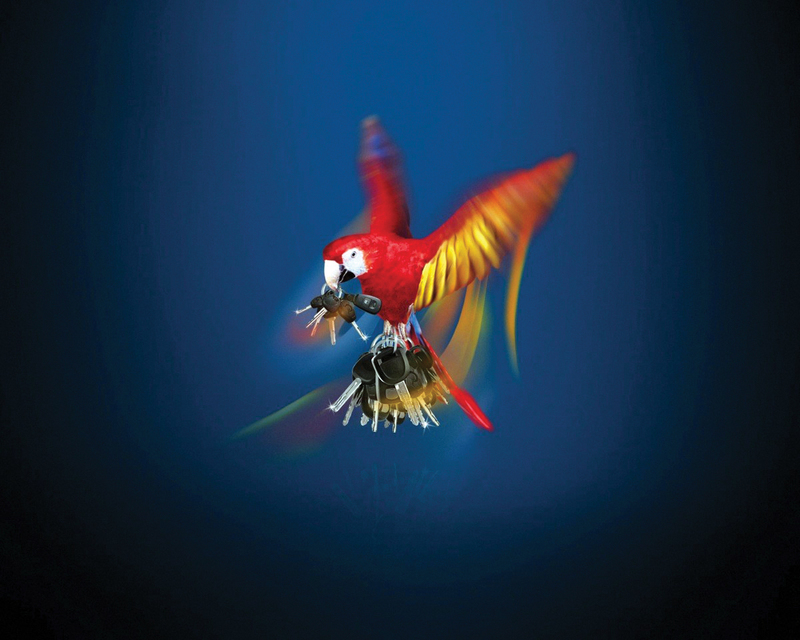 The parrot is the mascot for the company, having first been used in 1925. Glasurit has an extensive range, which has been developed continuously over the company’s history. Its roots are in Germany in the 19th Century, when in 1888 Max Winkelmann founded a lacquer and paint company in Hamburg. Over the years, the business grew astoundingly, with an early success being its white enamel, ‘Crystal White’, which was often used on ocean liners. The name Glasurit was registered in 1898, allowing Winkelmann to sell all of his products under one brand name. The ‘Glasur’ part means glaze. A parrot mascot was added to the tins in 1925, a motif that is still featured in its branding to this day. Following WWII, the need for paint expanded rapidly and during this period the manufacturer started to achieve further growth into the automotive sector. The brand was taken over by its current parent company, BASF, in 1965. BASF manufactures various chemicals for industrial use, particularly in the automotive sector. If you take a car for example, Mark said 70% of the materials it is constructed from are likely to contain chemicals manufactured by BASF, including lubricants, coolants, plastics, etc. As the company has grown, it has of course developed its products, ensuring they are up to date with the latest paint technology. For instance, in 1992 it brought out its first waterborne basecoat system, 90 Line, which featured reduced amounts of solvents. At the time, cutting down on these substances was a major advancement in the world of paint. 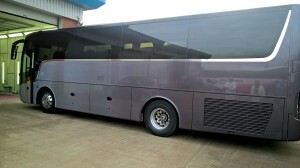 This First bus has been coated in Glasurit’s paint. 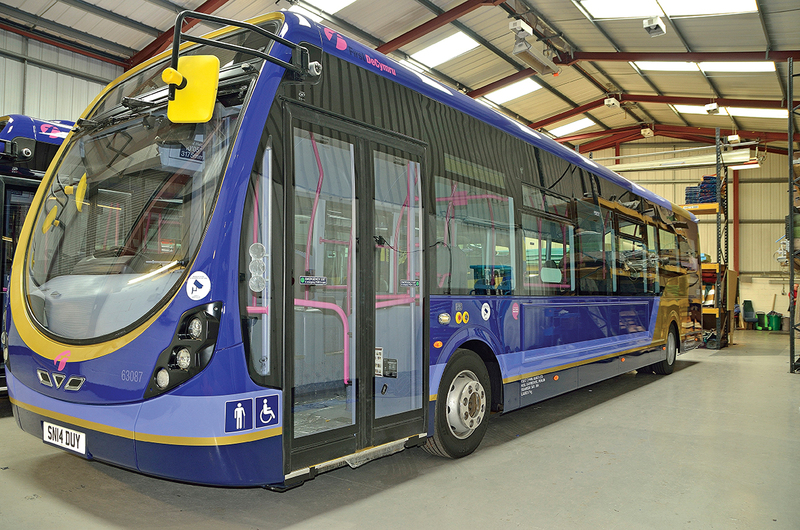 A strive towards innovation is still the case today, with one of Glasurit’s latest developments being an update to its top coat for bus and coach applications. Its chemistry has been altered to ensure an even glossier finish. Mark said that presentation of vehicles, including their paintwork, has become ‘more and more important’. In the past the focus for customers may have been on the price of the paint, but now he observes there is a move towards quality. This is especially the case when it comes to painting coaches, he said. One of the reasons behind this change is the development of premium operations, according to Mark. 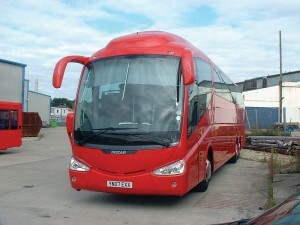 He cited Arriva and First, who he says have been working to make their fleets even more modern looking. Some more paintwork where Glasurit paint has been used. 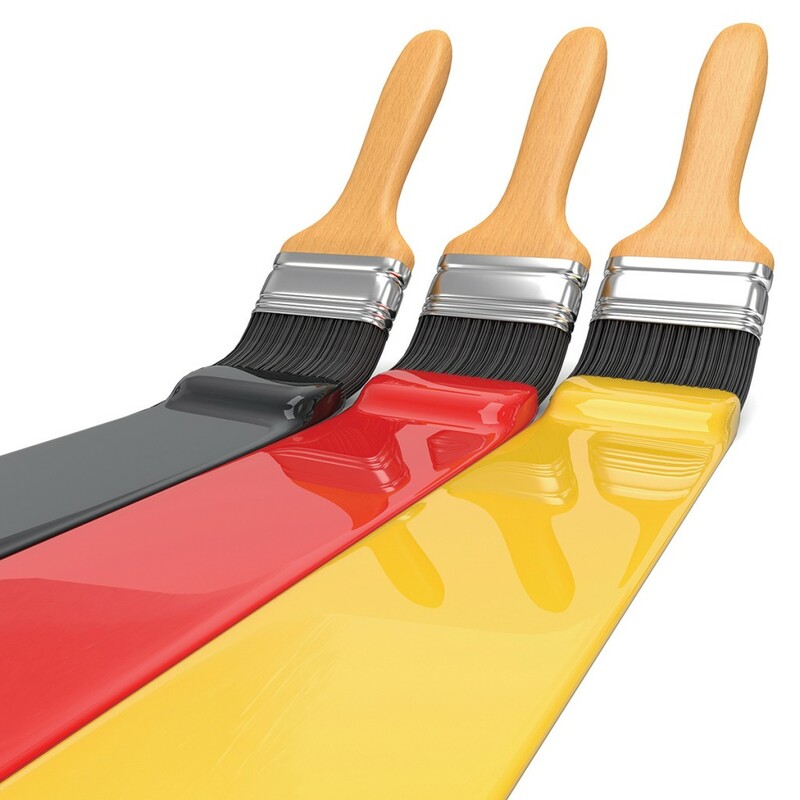 A new chromate free multi-substrate paint has been introduced too. This is ahead of new legislation set to come into effect in 2018, which requires all paint products to be free of chromate. The HSE (Health and Safety Executive) deems these products to be hazardous to users’ health. This newest product from the company can be painted onto any substrate, from aluminium and steel to carbon fibre. However, not all of its developments are based on legislation. Glasurit aims to improve its paint to provide a better solution for its customers, having recently done this with the launch of an anti-scratch paint. Using this overcoat should ensure scrapes the paintwork suffers, such as from overhanging branches, will ‘self heal’ with the marks diminishing over time as long as they are not too deep. This works with the help of heat, with sunlight warming the coat up and enabling it to ‘flow out’ into the graze, affectively smoothing it over. It does not ‘melt’ the paint, but softens it slightly, according to Mark. 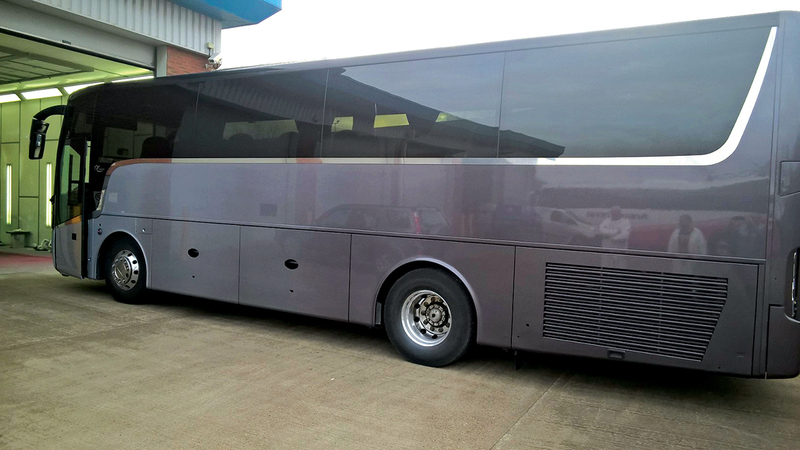 A Van Hool fresh out of the paintshop following a coating of Glasurit paint. Providing the best products it can is one aspect of what Glasurit does, but it is not just about selling the paint and leaving customers to it. Colour matching can be arranged too, with its technical sales specialists going out to customers with a spectrophotometer. This device is used to determine exactly what shade something is, allowing users to select the correct colour. It has been used to ‘measure’ a vehicle’s livery colours in order to select the right paint for coating the rest of the fleet. It is mainly refurbishment shops that buy Glasurit’s products, but Mark said there are fleet operators that use its paints in their own workshops too. It is not just the aftermarket that Mark is focusing the business on. 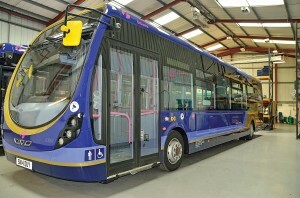 This year he hopes to engage bus and coach manufacturers, promoting his products amongst the likes of ADL and Wrightbus including looking at their painting processes to see how they can make them more efficient.